The Nigerian Army has acquired six vehicles to enhance communication in its fight against insurgency in the North-East. The News Agency of Nigeria (NAN), reports that the vehicles were inaugurated by the Chief of Army Staff (COAS), Lt.-Gen. Tukur Buratai, during his visit to Lagos on Wednesday. 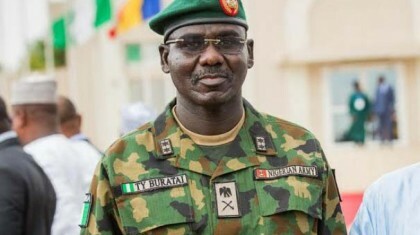 Buratai said the vehicles, procured by the Army Signal Corps, would be deployed to help in prosecuting the fight against insurgency in the North- East. “We are still pursuing the terrorists and we will continue to do that. The situation is so far so good as the troops are doing very well. “We are also handling the criminal elements in the Niger Delta and also the criminal elements that are around the herdsmen saga”, the COAS said. NAN reports that the COAS also addressed troops at 81 Division in Bonny Camp as part of his first official visit to Lagos. Buratai told the soldiers to establish very good and cordial relationship with civilians. He warned them not to allow themselves to be used for any criminal act against the society or the country.